Shan ge or mountain songs as the name suggests, are songs sung amidst the mountains and nature. As they are usually sung outdoors, the singing style tend to be loud, clear and reverberating. Phrases also tend to be long and the rhythm much more varied than that of the hao zi. Rhythmically free melodies also occur quite often. They usually utilizes a wide vocal range, are highly improvisatory in nature and reflects greatly, the life and ideas of the people, much more so than the hao zi which are mainly confined to aiding work. They are often used to express feelings of love, or the hardships of life. There are many types of mountain songs, each being a product of a particular geographical area, and can be grouped thus common shan ge [一般山歌] which includes xin tian you [信天游] shan qu [山曲] hua'er [花兒] jiang zhe shan ge [江浙山歌] si chuan shan ge [四川山歌] yun nan shan ge [雲南山歌] hu nan shan ge [湖南山歌] agricultural shan ge [田秧山歌] shepherding shan ge [放牧山歌] The common shan ge are found often in the highland areas and less commonly in areas with wide plains. 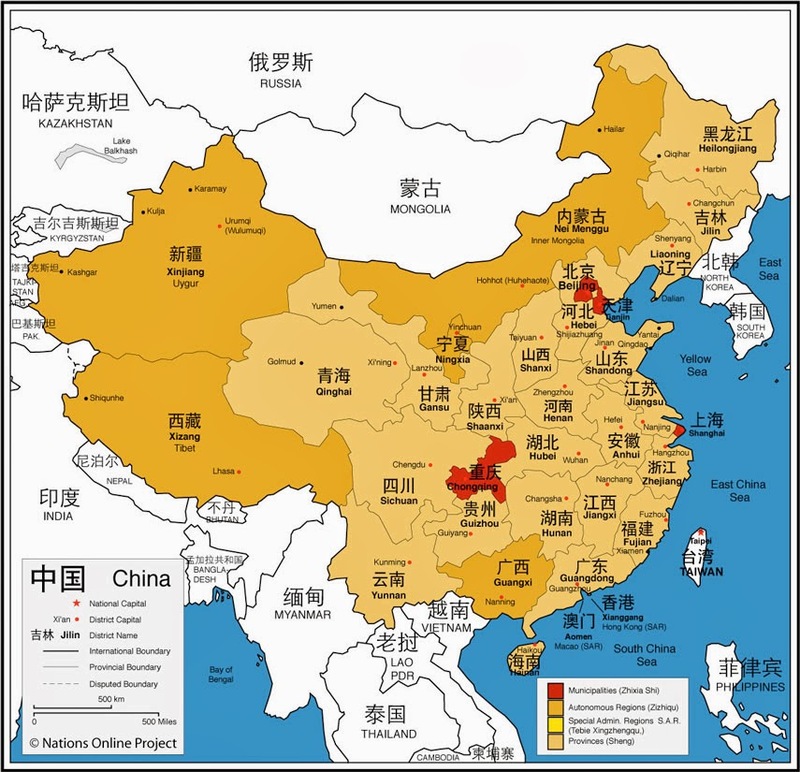 Areas in which they are popular include the Northwest [西北], Southwest [西南], Xiang'e [湘鄂], Min, Yue, Gan [閩粵贛] areas. Because the common shan ge can be found in so many areas, it is known by many different names. and southwestern parts of Inner Mongolia (内蒙古西南). The xin tian you is sung with chest voice or head voice and never falsetto. It is grouped in 2-phrased structure, though number of words in each phrase may vary. Phrases are structured using poetic rhetorical techniques, with objects personifying ideas and emotions The contents of the xin tian you often expresses love and longing, or the hardships of life. Many times, the xin tian you opens with an unrestrained and passionate first phrase, with notes in the high registers and plenty of wide leaps. The shanqu山曲) is another type of common shan ge that is found in the northwestern parts of Shanxi (山西西北部) and the northern parts of Shaanxi (陕西北部). This type of mountain song is often in duple time, with triple time rare. It also has a 2-phrased structure, usually with regular number of words to each phrase. The shanqu is frequently in pentatonic or hexatonic scale, and the zhi and shang modes often used. (For an explanation of the different modes andpitch-centricities, click here.) Unlike the xin tian you, there is use of both chest voice and falsetto. The regions in which shanqu are found usually experience long periods of drought and famine. As a result, the hard life that the people in these areas experienced created a unique form of activity to escape from the hardship - “Walking the West Pass” (走西口) – the pass from Shanxi to Inner Mongolia to eke out a living. Those who went could only come back perhaps once a year, and many perished in the hard life there as well, never to return. Songs were thus sung about this activity, songs full of yearning, longing for loved ones, and songs about suffering and hardship. Another type of common shan ge, the Hua'er (花儿) can be found in Gansu (甘肃), Qinghai (青海), and Ningxia (宁夏). There is a conglomeration of many different cultures in these areas and the artistic and musical characteristics of this kind of mountain song is quite different from that of the other kinds of common mountain songs. The hua'er are love songs and they cannot be sung indoors, nor sung to one of a different generation or to relatives. It is usually made up of a 4-phrased structure, with 2 phrases at the beginning contrasting with 2 phrases at the end; or a 6-phrased structure, 3 phrases at the beginning, 3 phrases end. Within these 3 phrases are made up of 2 whole phrases with a half phrase interjected in between. There is a wide melodic range with plenty of leaps in the hua'er, and the tempo is often slow and rhythmically free. It is sung with a mix of chest voice and falsetto. The Jiangzhe Shange (江浙山歌) are mountain songs found in the Jiangzhe area (江浙), the southern part of China. Unlike northern mountain songs, there is not as much emergence of a very clear artistic characteristic of this group of mountain songs. 4-phrased structure is frequently found but on the whole the formal structure is much more free. The melodic range is narrower than mountain songs of the northern area and the melody moves by steps and skips more than leaps. The Sichuan shange, Yunnan shange, and Hunan shange are a few other types of common mountain songs. Besides the large subgroup of mountain songs grouped within the common shan ge, there is also the Agricultural Mountain Songs or tian yang shan ge (田秧山歌) that are sang while planting, harvesting, and taking care of the daily agricultural activities. In the past, land owners would employ troupes singing agricultural shan ge to motivate the workers while they are engrossed in these intense periods of hard labour. This is different from the agricultural haozi in that the music is not dependent upon the labour since it is being sung by a specialised group of singers and not by the people employed in the labour themselves. Finally, there is also the Shepherding Shange (放牧山歌) that is sung for self-entertainment by shepherd boys. The content usually revolves around daily happenings, and the songs are lively. Sometimes the calling of the herds are also incorporated into the song. A few artistic characteristics can be distilled from these mountain songs. Firstly, the music is straightforward, bold, and unrestrained. Many a time, the use of the shange is to express emotions that cannot be repressed and hence the lyrics and the music are very explicit in the attempt to bring across these passionate feelings. The music may not be very delicate or well-polished but within the roughness is the urge to express heartfelt emotions which touch listeners deeply. The shan ge is often made up of long melodic phrases with varied rhythmic patterns. There is a frequent presence of rhythmically free passages close to natural talking for the expression of deep, passionate innermost feelings. There is also an interchanging with rhythmically regular phrases to provide dramatic and musical contrast. The melodic range is of the shan ge is usually wide with frequent leaps and big movements in melodic line. The melody is also frequently in the higher registers and very often, the highest notes appear right at the beginning, passionately touching listeners and also serves to attract listeners attention. Mountain songs are usually structured in 2-phrased or 4-phrased sections: Northern shange usually have corresponding question and answer phrases while southern shange often appears with 4-phrased structure, an extension of the 2-phrased structure. Other different number of phrases are also sometimes present, but these are all extensions of the basic 2-phrased structure. The ending note of each phrase usually falls on the tonic or a closely related pitch creating a linear harmonic integrity within the song. The phrases may not be exactly balanced, creating an improvisatory feel that makes the music sound unrestrained, passionate and free. These are achieved also, in addition with pauses on certain notes, changes in tempo, and extension of ornamented notes.